This is a handy guide to mastering winning skills and techniques for lacrosse players. The modern-day sport of lacrosse has its roots in games played by North American Indians. This fast-paced, competitive game requires great endurance and skill, and it is the fastest-growing youth sport in the United States. Lacrosse for girls is very different from lacrosse for boys, making this book a valuable resource for coaches and parents as well as female athletes looking to understand and master the game. 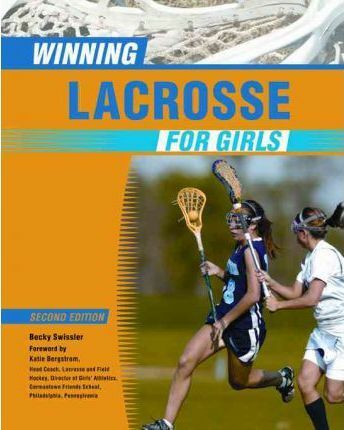 "Winning Lacrosse for Girls, Second Edition" covers everything from basic moves to expert skills. It offers drills and exercises to help girls learn and perfect their plays as well as information on conditioning to help athletes get into top shape and avoid injuries on the field. New to this edition are more than 110 full-color photographs and diagrams, as well as new tips for improving stick handling, shooting, goal keeping, and playing as part of a team. A special section discusses warm-ups to avoid anterior cruciate ligament (ACL) injuries. The chapters include: History and Rules; The Basics: Cradling; Individual Offenses: Dodges; Individual Defense; Passing and Receiving; Goal Keeping; Shooting; Team Offense; Team Defense; and, Conditioning. "Well organized, clear, and concise... This guide has been sorely needed for years..." - School Library Journal"
Becky Swissler is the athletic director of Wilmington Friends School, a former high school and collegiate player, and the former coach of the girls' lacrosse and field hockey team at Portsmouth Abbey School in Rhode Island. She lives in Wilmington, Delaware. Katie Bergstrom is the head coach of a lacrosse and field hockey team as well as the director of girls' athletics at the Germantown Friends School in Philadelphia, Pennsylvania.